Meilan Limousines and Antiques was recently mentioned on a Style Me Pretty article. The contemporary wedding took place in the lovely Miami Beach Resort and Spa. Photography provided by our good friends at Corinna Hoffman Photography. Enchanted Brides of South Florida Magazine - Issue Spring/Summer 2010 has included a featured article on a winter wedding that took place at the Ritz Carlton in Miami. Our 1936 White Rolls Royce antique was featured in the article. We were very happy to have been a part of such a special wedding. Images were captured by the talented team from Unique Design Studios. 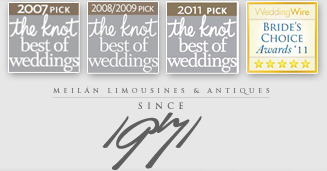 Meilan Limousines and Antiques is happy to announce we have been awarded for the fourth time, The Knot Best of Weddings Award for 2011. This award is voted by recent brides which have found our services to be worthy of the Best in South Florida. We'd like to thank those brides who voted for us this year! Meilan Limousines and Antiques is humble to have been awarded by brides the Wedding Wire Bride's Choice Award for 2011. We appreciate the love and the time you take to vote us in!